Prototype: German Federal Railroad (DB) version for limited stop passenger trains, for the train route Augsburg - Donauworth - Treuchtlingen - Nurnberg. Express freight baggage car as a type MDyge 986 auxiliary baggage car with walls sheathed in plywood. Chrome oxide green basic paint scheme. The car looks as it did around 1975. Model: The minimum radius for operation is 360 mm / 14-3/16". 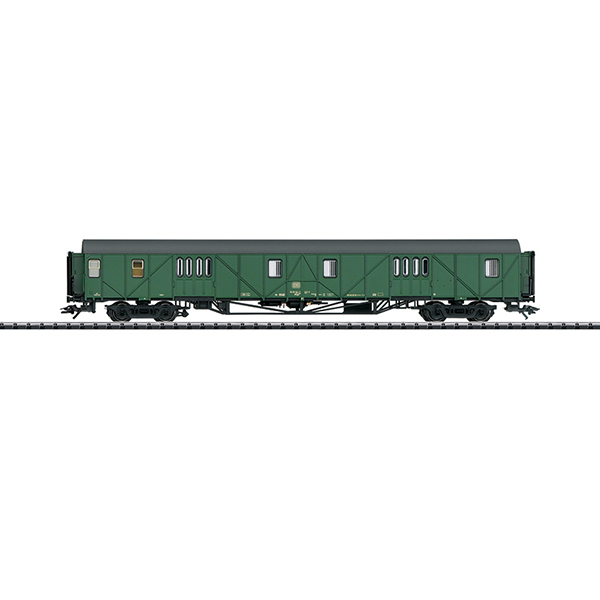 The auxiliary baggage car has "Schwanenhals" / "Pennsylvania" style trucks. It also has factory-installed interior lighting with warm white LEDs. Length over the buffers 26.3 cm / 10-3/8".